Sister Agnes Mariam, former fellow hippie, talking about the possibility of Syrian reconciliation in Denver. I was pressured not to go hear her, so I went to two of her presentations instead of only one. 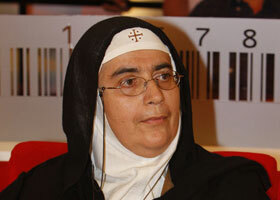 What a cool nun. Next to her is Father Andrew of the Maronite Church, good man in his own right. Note, a more extensive article will follow in the next few days. Most salient point: Support the Geneva II process for a negotiated settlement of the Syrian crisis.